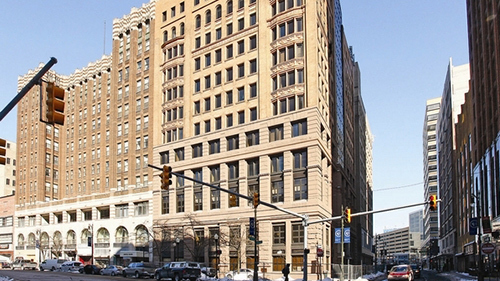 Given a long history of disinvestment and local neighborhood income at 39.5 percent of the area median, rehabilitation of 1212 Griswold in Detroit’s Midtown neighborhood brought office space already leased to the Archdiocese of Detroit, loft-style apartments, and first-floor retail. Residential units include a mix of affordable and market-rate apartments to align with the needs of the Midtown community. 1212 Griswold Lofts redevelopment was complated within 2015 and accompanied the recent neighboring developments at 1145 and 1249 Griswold. Synergy in localized development was aimed at boosting traffic and returns to the community, thereby spurring additional area investment and development into the future. Urban Partnership Bank & Liberty Bank and Trust Company – CDFI, Minority Banks, and longtime NCIF partners – acted as project lenders. The banks gained hands-on experience with the New Markets Tax Credit program, which strengthened their capacity for future projects.